In an effort to reduce the amount of vehicular crashes around the capital, the Ministry of Public Infrastructure has installed 33 speed humps on various streets. According to a spokes-person from the ministry, the speed humps were installed for “safety reasons” and the contract was awarded to Sim Inc. The project was completed about two weeks ago and saw the 33 speed humps being placed mostly on those roads that lead to priority (major) roads. According to Traffic Chief Dion Moore, the ministry consulted the Traffic Department and was advised as to where the speed humps should be placed for maximum safety. The increase in accidents around Georgetown was one of the driving factors behind the ministry’s decision to place speed humps on the roads. 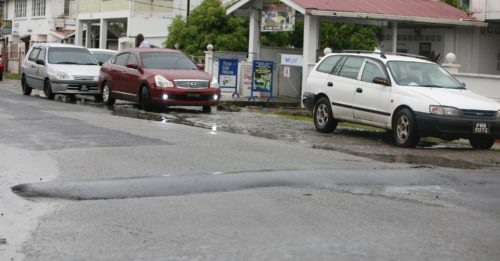 Stabroek News spoke to several drivers who traverse the city regularly and they all said they were in support of the speed humps, which would reduce the amount of accidents that are caused. “Some people don’t know the difference between a priority road and a non-priority and everybody think they got the right of way to just cross the road without stopping and that’s why they does got all these lil accidents around the place. Nobody does want to stop or slow down and so they does end up running into each other at the intersection,” a taxi driver, Jason (only name given) told this newspaper yesterday. The man said he was in support of the speed humps and advocated that more should be placed along the other non-priority roads in the city. “I remember about a couple months ago, I was in an accident at the intersection of Albert Street and North Road and it was cause the man that was coming from the non-priority road didn’t want to stop and run into me, so of course I support it,” another driver, who traverses the city daily said. The man explained that now drivers will be forced to slow down when they are approaching priority roads, which will prevent a lot of “simple” accidents that are caused every day. “Simple things like slow down, does make these man put themselves in nuff expenses and I don’t know what’s so hard about that. Sometimes the accident could be simple and another time it could be real serious cause you never know how bad it could be so I glad about it,” the man explained. This newspaper observed speed humps on all non-priority roads leading into Camp Street, on King Street, Wellington Street, and other parts of the city. Currently, many of them are still unpainted. Stabroek News was also unable to ascertain the cost to construct the 33 speed humps, but was told that the ministry does not plan to install any more at this point in time.